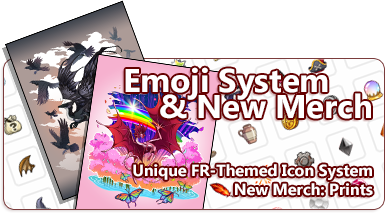 Add some flair to your forum posts, clan biographies, dragon biographies, and private messages with Flight Rising's new emoji system. We've also got a few new items available in our Hivemill merch store! Be warned, though, each time you use an emoji, 5 will be deducted from your account. This system will also share icon imagery with the upcoming Lair & Hibernal Den revamp, so any icons added for one feature will likewise be available for the other! 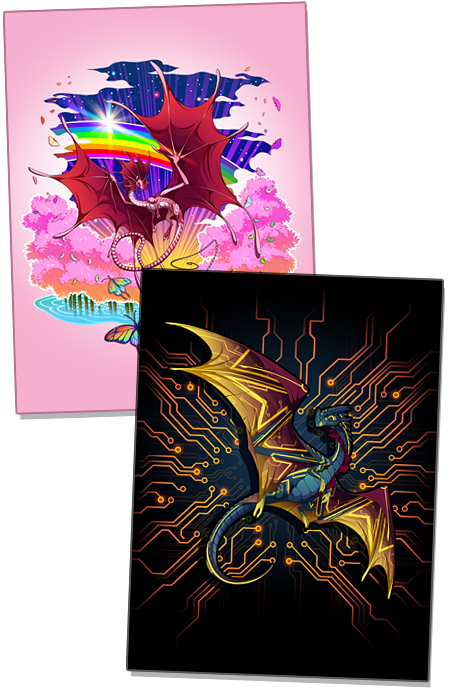 We're continuing to expand the available items on our Hivemill merch store, and starting now, you'll find a few more awesome options! You can now purchase prints in a variety of sizes! We are currently only offering prints that match all of the t-shirt designs we launched the merch store with, but will be adding more over time. They are adorable. I especially approve of the DNA one. PS: I hope a cactus will be among the next icons to come. EMOJIS?! [emoji=deer skull][emoji=deer skull][emoji=deer skull] Oh my god I already found my favorite! Oh my god I already found my favorite!